Like every movie, Avengers: Infinity War has an ending. But like most Marvel movies — and as is increasingly the case, the installments of most big movie franchises — it doesn’t really have an ending. The movie doesn’t so much resolve as it leaves us wondering what’s going to happen next. Nothing actually ends — it’s just paving the way for another installment we’ll need to watch in the near future. The term for this kind of ending is, of course, the cliffhanger — the name coming from the idea that the main character is left metaphorically hanging off the end of a cliff in great peril at the story’s conclusion. To find out what happens, we’ll have to tune in for the next installment. This plot device isn’t exactly new — Charles Dickens used to write his novels this way, publishing serialized pieces before binding them all together for a finished book — but modern movies have perfected it. On the face of it, the idea of a cliffhanger would seem to be anathema to Hollywood, which is obsessed with ensuring that audiences walk out of the theater with a happy ending. Studios tweak their movies’ finales all the time to make sure they’re satisfying or triumphant enough — viewers don’t respond well to sad or ambiguous endings, we’re constantly told — and yet, more and more blockbusters are content to string us along. Harry Potter and Twilight had two-part finales, which meant that people paid money for a Part 1 knowing full well that Part 2 would cost them even more. The Marvel Cinematic Universe has been going on for 10 years now, and for most of that time, the studio has been getting us to go to its movies by teasing us with the fact that bigger things were on the horizon. If you didn’t see Thor or Captain America: The First Avenger, basically you were screwed by the time Avengers came around: They were all interconnected, with each film’s ending ultimately hinting at something grander down the road. It should be tired by this point, but I’d argue that Infinity War is the kind of cliffhanger that justifies the whole silly, cynical gimmick for a very simple reason: It actually fooled me and absolutely floored me. While I knew that we’d be getting a Part 2 next year to this storyline, I wasn’t sure exactly how the Avengers’ epic battle with Thanos over his pursuit of the Infinity Stones was gonna be resolved. Of all the guesses I could have made, though, the one I wasn’t planning on was the good guys losing. Despite all the movies that Marvel has made, that’s a plot point they’ve never introduced before, and Infinity Wars utilizes it pretty compellingly. It’s not just that Thanos gets all the Infinity Stones — it’s that he goes ahead with his monstrous plan of thinning out the population of the galaxy, as we watch several of our heroes blow away like dust. For a split second, you forget about the fact that there’s a Part 2 coming or that there’s probably next to no chance that all those Avengers are really dead. 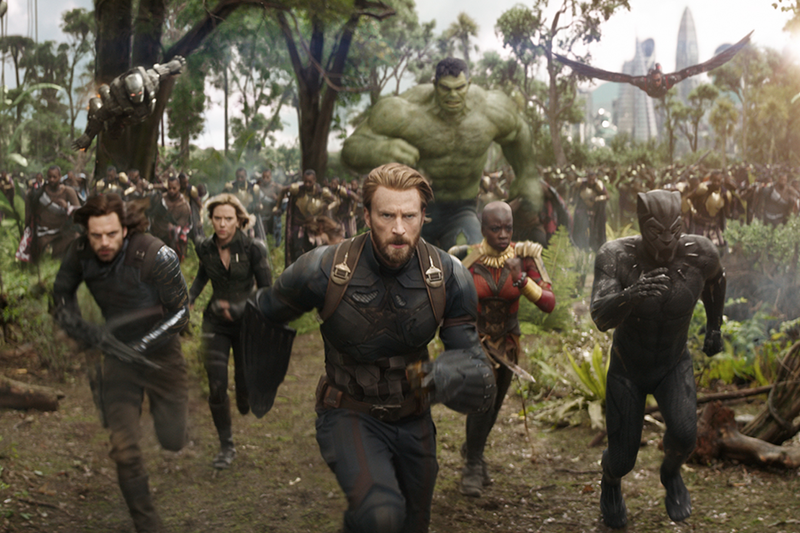 In that moment, Infinity War just gets you wrapped up in what’s fun about cliffhangers and serialized stories — which is that they can be addictive. Nobody walked out of The Empire Strikes Back assuming that was the end — instead, we were dying to know how George Lucas was going to get himself out of the crazy corner he’d painted himself into. Television dramas as diverse as Star Trek: The Next Generation, Breaking Bad and The Handmaid’s Tale have specifically crafted preposterously harrowing season-enders because they wanted us to spend the show’s downtime wondering what the hell was going to happen next. In that way, a cliffhanger becomes less of a tease and more of a magic trick: How are they gonna get out of this fix? I’ve already heard people grumble about Infinity War’s shocking ending. “They’re not really dead,” they say. “Marvel’s gonna undo a lot of what happens at the end of this movie.” Of course, but we don’t know exactly how — and that’s entirely the fun. We don’t keep watching because the guy is hanging over the cliff, we keep watching because we’re excited to learn how he pulls himself to safety. Here are a few other takeaways from Avengers: Infinity War. #1. I feel bad for Jeremy Renner. Renner is a two-time Oscar-nominated movie star with plenty of big credits who has been part of the Marvel Universe for years. And I completely forgot about him. Even worse, I didn’t even remember to think about him in the first place. I don’t believe I’m alone either Renner first appeared in the MCU in Thor back in 2011 — I had to look this up because I have almost no memory of it — and in the intervening seven years, he has been spectacularly unmemorable. He plays Hawkeye. That’s all I know about him. Oh, right, he has a happy family life — I sorta remember that from Avengers: Age of Ultron. But mostly, I know him as the guy who shoots arrows. But he’s not even cool about it, like Katniss in the Hunger Games movie. Perhaps Renner is also aware of how lame his character is. When he hosted Saturday Night Live in 2012, he did an Avengers bit where he acknowledged how worthless Hawkeye is in a fight. But Hawkeye is so boring he kills comedy, too. The Marvel brain trust has explained that Hawkeye is missing from Infinity War for narrative reasons. (Never mind that, previously, the studio had insisted that Hawkeye would definitely be in the movie, even though he wasn’t featured in the film’s posters.) Still, there was a contingent of fans who were pissed, starting a #WheresHawkeye hashtag months ago because they were concerned he wasn’t getting equal treatment alongside Iron Man, Captain America, Thor and other Marvel characters people actually like. It’s nice to know that Hawkeye has his advocates, but they’re also the kind of oddballs whose favorite Beatle is Ringo. #2. According to Ashley Madison, your girlfriend wants to have an affair with Thor. So, what about the guys? According to Ashley Madison’s findings, 46 percent would choose Wonder Woman, while 25 percent went with Supergirl and 18 percent preferred Black Widow. Interestingly, tied for fourth was Invisible Woman … and Tony Stark himself, Iron Man. On the villain side, women most wanted to hook up with Loki (24 percent), while guys gravitated toward Catwoman (49 percent). Actually, both sexes want to get with Catwoman: She tied for second on the women’s list, at 12 percent, alongside the Joker. I guess this all just proves that Ant-Man is more boyfriend-material than affair-worthy. #3. This is the dumbest moment in ‘Infinity War’ — and it didn’t have to be. A lot of the emotional beats in Infinity War are planted in earlier films, which then play out superbly in this new installment. Vision and Scarlet Witch’s romantic relationship is cemented and then challenged. Tony Stark’s uneasy mentorship of Peter Parker reaches a new level. And Star-Lord and Gamora’s burgeoning relationship is destroyed. Unfortunately, it’s that last point that leads to Infinity War’s stupidest plot twist — one that could have easily been fixed. In the film, Star-Lord (Chris Pratt) and Gamora (Zoe Saldana) square off with Thanos, her adoptive father. Unbeknownst to Star-Lord, Thanos kills Gamora in order to attain the Soul Stone, so later when Star-Lord, Iron Man and others are battling the mighty Thanos, he has no idea his girlfriend has died. The whole point of this battle-royale scene is that our heroes are close to pulling off Thanos’ glove, which houses the Infinity Stones — but to do that, they must keep him subdued. Unfortunately, in that moment, Star-Lord finds out about Gamora’s murder, gets really mad and riles up Thanos, who powers up and swats all the Avengers away. This is a dump plot point, for two reasons: (1) Couldn’t Star-Lord have calmed down for, like, a second so they could get the glove off and save the universe? ; and (2) pulling a tight glove off a super-powerful being isn’t the best way of handling things. I don’t know. But next time the universe is in peril, the Avengers and Nick Fury should call her instead of Captain Marvel.